Sunshine celebrated Betty Dalgleish’s 93rd birthday. It ushered in one of Betty’s 16 great-grandchildren, “Addie-for–Adelaide,” her smallness and innocence a joy. Wait staff and residents sang greetings to Betty who shared her day with smiles and serenity. Smiling serenity is a work of art for her. At Suffield by the River (SBTR) residents practice many arts and skills. Vicki Markowski’s story telling narrates the history of every work she’s produced. Self-taught, Vicki acquired skills while delighting in every stitch and stroke. She copied florals, still lifes, portraits and old masters, learning from the masters themselves. A newlywed in Suffield years ago, Vicki found no electricity available to power her sewing machine so entirely by hand she made a slipcover, including the welting. 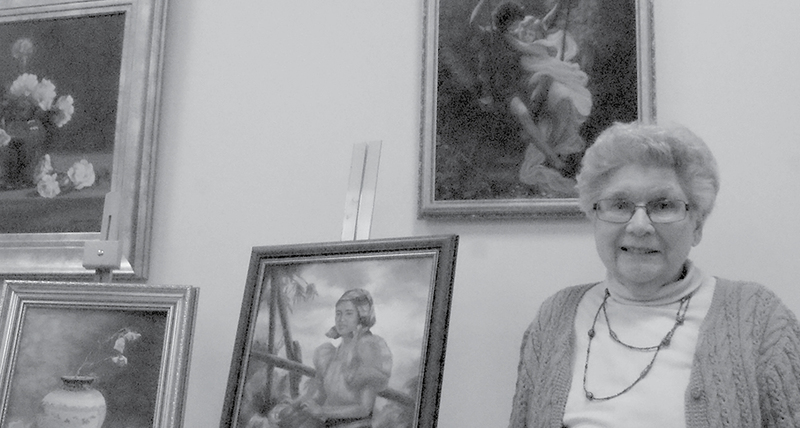 Vicki Markowski’s skilled copies of masterworks are among the impressive art works that seven residents of Suffield by the River exhibited in an activity room there during February. Althea Scheller, sister of the late Ro Whitney, moved to Suffield from Watchung, NJ bringing her impressionist pastels, still life flowers, autumn landscapes and portraits. Althea’s friendship with painting began at the age of 12 in long recuperation from rheumatic fever. Her parents introduced her to pastels and Althea has taken lessons and enjoyed learning new ideas ever since. From Baltimore Roseann Mark went to her Boston studio favoring impressionism and semi-impressionism while treasuring Italian landscapes and ancestral villages. In Provincetown summers Roseann painted and sold seascapes from the gallery she and Bill maintained there. Several years ago a major stroke interrupted her painting. Working with therapists, Roseann is regaining painting strength. 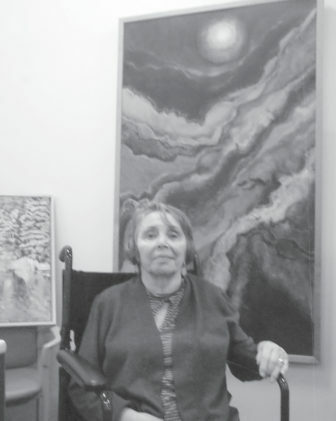 Roseann Mark is pictured with two of her abstract paintings among the several works she included in the activity room exhibition. Pat Keney began painting when she retired at 68. From Hartford and Windsor Locks, she lived in Suffield for a time, water coloring farmscapes and vintage homes. She gives her beautifully framed painting of her former Suffield home a place of honor in her Suffield by the River home. Pat Keney teamed up with Pat Marinone, formerly of Enfield and Windsor Locks, to plan SBTR’s February art exhibit with Recreation Director Liz Sansom. Pat Marinone has done water color land and seascapes in Suffield and Old Lyme. Paul Crocker, a drummer who had his own 5-piece band called The Moonlighters, displayed two miniatures, Band in a Bottle and Time in A Bottle. New to Suffield by the River, Paul makes his own miniature tools to make his miniatures in bottles. He tops off the juice bottles with walnut caps he carves himself.